Home Clubs There Will Be Experienced Judges and Prizes. 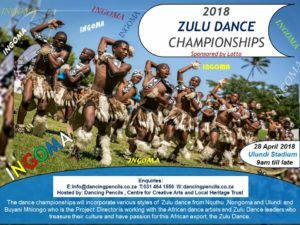 An exciting Zulu Dance Championship is scheduled to take place on the 28 April 2018 at Ulundi. Buyani Mhlongo of Centre for Community Arts and Local Heritage Development Trust is experienced in working with large groups and he is the energy behind the creation of this eventful concept. Last year 2017 he was instrumental in organizing an expedition to Wales in the UK where a contingent of 100 Zulu men re-enacted the Battle of Isandlwana and the Zulu Dance Championship is developed to gather over 1500 at one venue to compete, entertain and perform a collaborative choreography which is a point to the World Record Attempt envisaged to be staged once all funding is secured to meet World Guiness Book of Records standards and requirements. Dancing Pencils have accessed Lotto grant this year for Centre for Community Arts and Local Heritage Trust to coordinate the spectacular Zulu Dance Championships. Buyani Mhlongo had originally planned for it to be performed at the prestigious Moses Mabhida Stadium in Durban an ideal venue to stage a world-class spectacular show and with capacity to gather the whole province to witness and participate in the world attempt. However as the funding received was very much smaller stakeholders decided to move the event to Ulundi, where the Zulu Dancers and traditional artists are traditionally based. 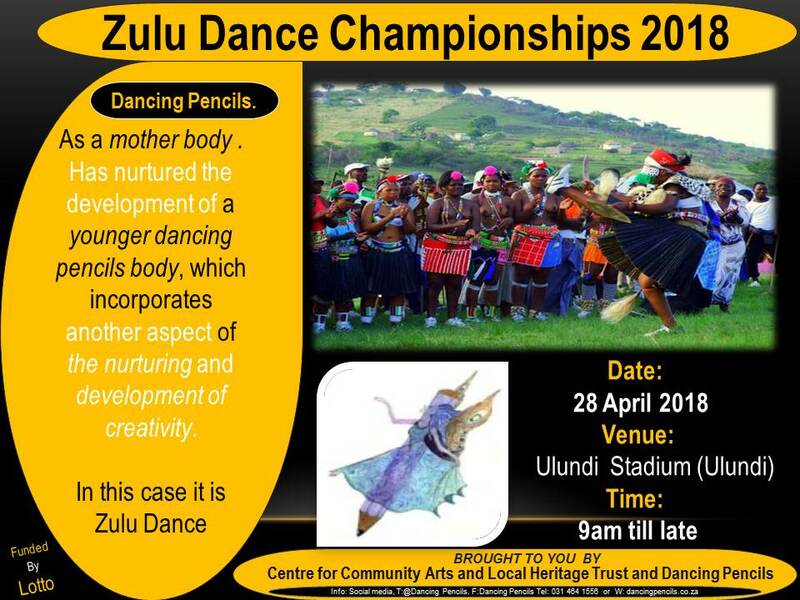 The dance championships will incorporate various styles of Zulu dance from Zululand District with its centre being Ulundi and Buyani Mhlongo who is the Project Director is working with the dance choreographers and Zulu Dance leaders who treasure their culture and have passion for this African export, the Zulu Dance. There will be experienced judges and prizes. We would like to make this an annual event. 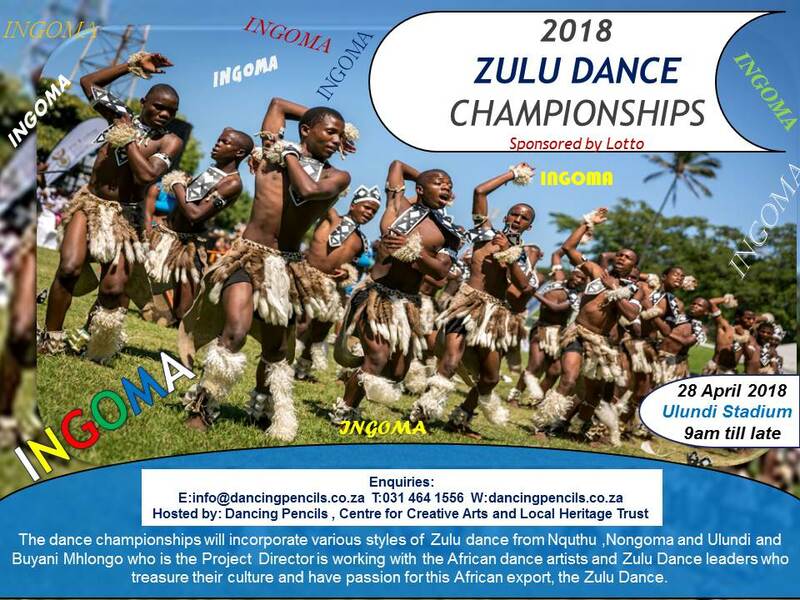 We also would like a sponsor who would take the winning team of dancers to create a dance show to travel to the uk and other countries to perform in various venues abroad thus creating jobs for Zulu Dancers and promoting Zululand and especially Ulundi Municipality our partners and the host of the event. At the Zulu Dance Championships there will also be Arts and Crafts Exhibition Stands and crafters will sell direct to the public and audience. We will work with Ulundi Economic Development Unit and Kwasa Foundation Projects local organisations that focus on arts and crafts development in the region to assist in identifying woman crafters in particular to take an opportunity to exhibit their works. This is an exciting element as we will showcase the best of crafts which are inspired by Zulu Culture and Customs. A special marquee will be created for Children’s Literature Development Workshops for Ulundi children to learn the joys of right brain writing set up for them, best work will best published and Ulundi Library will work with Dancing Pencils to coordinate this component which its main aim is to enhance the children’s development sector within Ulundi region. The count down has official began. Little people will sure enjoy themselves oj the sides while the drums and stemping by Zulu Dancers fills the stadium. It wouldn’t be a complete showcase if Maskandi is not a feature. A professional stage set up will be erected for different Maskandi acts that will provide background to dance group’s scenes and create a desired ambience to complete the project vision. We have an established project partnership with Ulundi Municipality and we also solicit support from Zululand Municipality, KZN Department of Arts and Culture, KZN Department of Economic Development and Tourism to realise a full scale delivery of the event. Buyani Mhlongo, Project Director on 081 536 3940 or Nozuko Teto, Media Liaison on 061 585 3774 for Centre for Creative Arts and Local Heritage Trust to discuss sponsorship opportunities and details on the initiative. 031 464 1556 or 079 256 6725 email: info@dancingpencils.co.za website: dancingpencils.co.za.